A bit of a run around this Sunday. First stop was Millmeece pumping station for the classic bike day. Sadly there were very few bikes, maybe because it clashed with the big show at Shugborough Hall. It's a good job the Midland Bullet riders were there - that meant there were at least another ten bikes there. 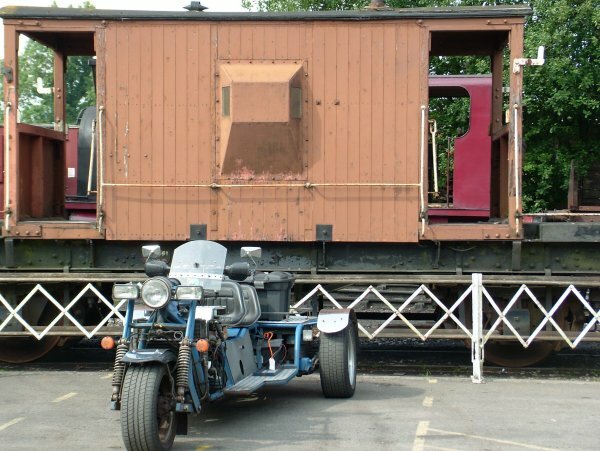 Next stop was the Foxfield railway, where two of the intrepid Enfield riders each had a clutch cable fail. Whilst they changed their cables I found the cafe where a well deserved bacon and cheese oatcake was consumed. I noticed, with some irony, that the name of the bar at this station was "The One Legged Shunter" I know how he feels.